I hibernated at my mom’s house all weekend to help out with some things (very good for the old bank account). We found ourselves in need of breakfast on Sunday morning and without anything to cook. 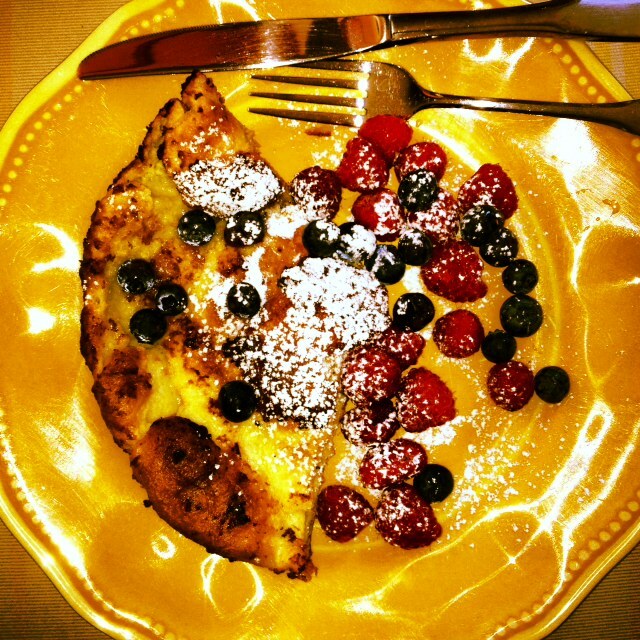 And then, I rediscovered Swedish Pancake, a family staple recipe clipped from Parade Magazine early in my childhood. Not only is this dish easy to make (and I mean EASY), it is super Discountess-friendly. It uses ingredients that are regularly in anyone’s fridge and pantry, and it comes out looking like you are the chef at the Four Seasons (which, for the non-Discountess types, has a totally decadent brunch). Preheat the oven to 475 degrees. Put the stick of butter in a cast iron skillet and place in the oven while it’s preheating. (Two notes: You can use a 9×13 pan too if you want it will just make a thinner pancake; Also, watch the butter to be sure it doesn’t burn). Whisk the eggs, flour, and milk together in a bowl until just blended. When the butter is melted and the oven is fully heated, add the mixture to the skillet. Cook for 12 minutes, until the pancake is puffed up and golden on top. Serve hot with whatever you have. I used powdered sugar and berries. It’s also delicious with maple syrup or jam. Perfect for a lazy Sunday or an impromptu brunch. Trust me, your guests will thank you.